Training is bowling along. Concentrating abit on the running side as I have the Wilmslow Half Marathon coming up at the end of March and want to try and keep my record up on that. Have been doing it for 4 years now, and have always beaten the previous year’s time. Over the years, I’ve managed to get down from 2 hours 24 minutes when I first wobbled round it to 1 hour 59 that I did last year, so a decent improvement over the years, but nothing double quick. Would really want to try and get under 1 hour 50 minutes so that why I’m trying to do more running training at the minute. I’m still doing some swimming, did a 4 km swim last week which felt fine but swimming isn’t too much of a problem. Cycling is more of a problem, but I’m trying to do some on the Wattbike in the evenings just to build up some bike strength and then hopefully wait for some better weather, or that’s the plan. Anyway, saw that there was a half marathon and 10k race at Oulton Park coming up so thought I’d put myself down for the 10k. Be a decent work out, it is run by xtramileevents who do the Wilmslow Tri so that should be sorted and just a novelty of running on the circuit. Completely forgot to enter until I saw a tweet to say 30 minutes before cut off, so did it with about 10 minutes to spare. It was then that I realised we had a night out planned for the Saturday, the day before so not ideal preparation. Rolled back home at about 12.30 the morning of the race and by the time my head hit the pillow, I was getting up again, or that’s how it felt. Down at Oulton by 9.00 so I could register for the start at 10.00. Felt quite windy driving down, and when I parked up, the door of the car flew open and nearly took the car parked next to me out. Was thinking of packing some running tights and a long sleeved top but didn’t bother, cosmic!! Got blown over to registration and began to question what I was doing, but at least there were a few hundred other idiots who’d been let out for the day as well as me. Back into the car to keep warm, quick gel and drink then wander down to where I thought the start was. Everyone was just milling about, then suddenly we all trooped onto the circuit. Bit strange as there was no loudspeaker or at least a big bloke with a shouty voice, but we all just followed. Walked up to the start, hung around for a bit getting more chilly, then there was a loud whistle, we all moved up to the start and away we went. The start was just at the beginning of a left hand bend, and as we rounded that, it was straight into the wind. Not great, and as we were doing 3 laps, knowing we had to face that 3 times wasn’t great for moral but hey ho. At the end of the straight into the wind, we had a hairpin and my next surprise, a hill!! Didn’t even cross my mind about hills on here, and as it happened, there were 3 hills on each lap, so guess it could have been called an undulating course if it was on the road. The photographer positioned himself at the top of the second hill and snapped away as we went past. One good point about this was you were able to download the pictures for free, which a lot of the races I’ve been in previously don’t do. Not really a lot to say about the race, it was cold and windy so doubt many PB’s about but I just enjoyed it. I wasn’t lapped which I got thinking about when I saw the leaders charging off so guess that’s a small win!! Finished in 53 minutes 30 seconds, not quick but happy enough and it gave me a decent work out. 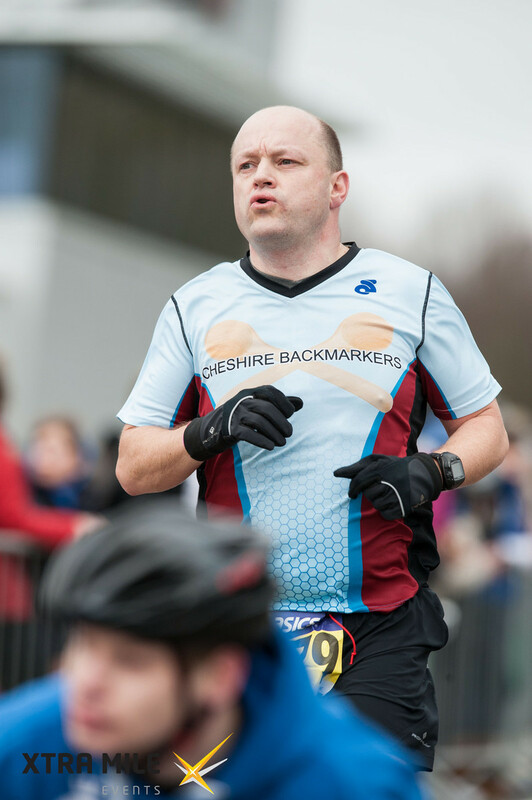 And it was the debut of the “Cheshire Backmarkers” team colours, so good day all round!! This entry was posted in Uncategorized and tagged extramileevents, oulton 10k, wattbike by malcolm68. Bookmark the permalink.